Come Back in the Spring! One of the brothers recently spent a week visiting the Republic of Moldova. Of course some people have heard of Moldova, and not just people who live in that part of Europe. “Isn’t it really poor? Haven’t they got a terrible problem with human trafficking? Wasn’t there some kind of war there? Hasn’t part of it declared independence? Oh, I think I saw it on the TV the other week – some people were storming the parliament, are you sure it’s safe?” Well, yes there are elements of the truth in all that... but beyond the clichés and prejudices what is the real Moldova like? Moldova is sandwiched between it’s big neighbours, Romania and Ukraine and there is a strong sense that it is still caught in between two worlds: “The West” and the former Soviet Union. It often seems to be like a political football for governments and even churches. But meeting ordinary people I was struck by how they get on peacefully despite differences of ethnicity, language, Christian denomination. It’s not at all unusual to hear people switching between Romanian and Russian and back as they speak. Although there are no real formal relations between the churches – in private there are many relationships at all levels across supposed divides. It’s there that you see God working – in the simple moments of every day life. Of course it’s important not to deny that there are tensions and life is difficult. But though the big picture seems to contain only division and hopelessness, at a personal level it is possible to feel a communion between people. They thirst to belong to each other. They do belong to each other. And though it seems a bit bleak at the moment, underneath Moldova is a beautiful place. The lasting impression that I was left with was of peace. The variety of different people I was able to meet in a week was impressive, and was due to the friendship that has built up over years, connections through people who had visited Taizé, and small groups of faithful young people who came to take part in the European Meetings in the last few years. I spent a lot of time in Chișinău, the capital. Physically the city still shows that it was built in Soviet times with huge wide boulevards and monumental buildings, but it’s also one of the greenest cities in the world - full of huge parks and tree-lined avenues. You can also feel these influences in the people – society is deeply marked by the legacy of communism, but there is also something deeper, in tune with God’s creation, really alive. The deep faith of many people is a strong witness to this. In the Catholic parish I was warmly welcomed for several prayers, including a beautifully-led prayer with the songs of Taizé. There were meetings with the young people and the not-so-young people. It’s a small, but active and faithful community that inspires by its resurgence after becoming legal again in the 1990s. One evening I was welcomed by the young people of Casa Concordia – a house for children and young people with no parents, or who cannot live at home. It was started by a priest from Austria, but is very much embedded in the culture of the country. Sitting in the basement around a roaring fire we shared stories and songs. I talked about what we do in Taizé, they talked about what they do together in their community. We were enjoying ourselves so much that we forgot to eat the cakes that they’d bought! Another NGO working with orphans and children from deprived backgrounds has just lost its premises. But undaunted they found an empty flat and are busy converting it into a place of welcome. It’s clearly worthwhile – the young people seem so at home, so happy and secure. One group was doing their homework with help from some of the volunteers. Others were making cards to sell to support the project. And there was also a little time to fly a paper aeroplane in the corridor and have the most delicious apple I’ve ever tasted, which some of them had picked in the park between the housing blocks. 36 hours spent in Transnistria, the breakaway republic on the eastern side of the Dniestr river, gave me the opportunity to meet and pray with two groups of really enthusiastic young people in Tiraspol and Rîbnița. One of the priests gave up his whole day to accompany me on this lightening tour. He had such a simple and unassuming manner. But I was most of all impressed by his commitment - called by the Gospel to leave his home and come here to minister to these people in often difficult circumstances. I was also privileged to spend a night in an Orthodox monastery. Noul Neamț was founded by monks who had come from the other side of Moldova (in what is now Romania). 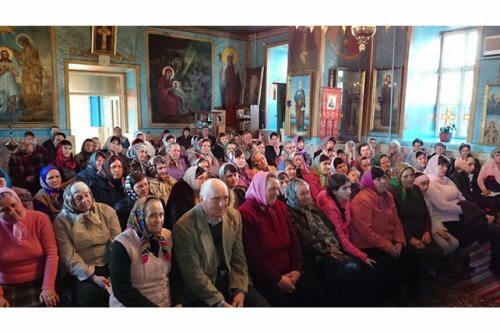 They brought with them the traditions and teachings of the venerable spiritual father of Neamț monastery, Saint Paisie Velichovsky, an important figure in the renewal of monasticism in Moldova, Romania and even further afield during the 18th century. 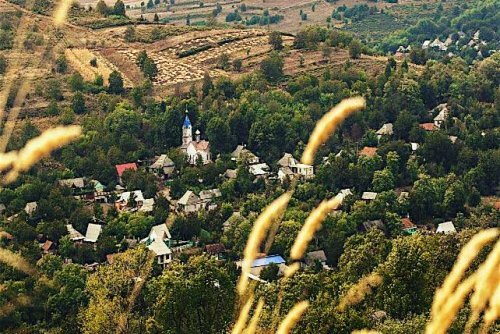 The village is controlled by the Transnistrian authorities and has a majority of Russian inhabitants, but the monks come from different ethnic backgrounds, as they did in Saint Paisie’s time. It was beautiful to witness the bilingual Holy Liturgy celebrated in the monastery, with the monks switching seamlessly between romanian and slavonic languages with each successive chant. Arriving at Chișinău airport at the beginning of the trip, it was a bright, sunny, unseasonably warm February afternoon. "It’s beautiful here", I remarked to the young people who met me from the plane. "Oh, but you should see it in the spring! ", they said. The people are proud of their country – but they want you to see it at it’s best! The people I met often don’t feel very hopeful, but there is a deep underlying hope and belief that you should come back sometime soon when things are more beautiful. And maybe that’s the gift of being a visitor – you can see these things more clearly when you come from outside. But to visit someone is also to give them a gift. And in that mutual giving there is God. And that’s why we need to visit each other.